How many people have relatives they would rather avoid, or even wish would just stay hidden behind closed doors? Too many. And how many of those relatives are threats (mental or physical…substance abusers come to mind) to themselves and others? Enough. But how many can say that their relatives are acting against the interests of the United States and by extension the west? Not too many. (except if one is an Islamic at heart…living under the protection of western freedoms…but up to no good) Most intrinsically, how many of us have the same clout as the Islamist-in-Chief, thus extending down to select wayward relatives? None. Herein lies the ties that bind Barack HUSSEIN Obama to his Islamist roots, even if one believes that Obama Sr was not his birth papa. The fact of the matter is that he bonded with his Kenyan narrative, and was raised in Indonesia for his formative years – rooted in his consciousness. In this regard, a recent commentary should be used as a primer – ‘The Ties That Bind The Islamist-in-Chief…To Sunni Islam’ – https://adinakutnicki.com/2012/09/25/the-ties-that-bind-the-islamist-in-chief-to-sunni-islam-making-sense-out-of-a-potus-bowing-to-a-saudi-monarch-commentary-by-adina-kutnicki/. While Obama’s connection to his Muslim family in Kenya is an acceptable topic for discussion in the Arab world, it is viewed as a ‘great taboo’ in the United States. Why is that so? This ‘taboo’ should be considered unfair at best, purely prejudiced at worst. Is it fair that we censor such discussions just because Obama’s relatives are ‘Muslim’? The Council on American Islamic Relations (CAIR) should condemn the media for keeping a tight lid on the subject. Isn’t it time to go beyond what is disclosed by President Obama in his Dreams from My Father or Wikipedia’s limited information, which includes the only photo released by the Obama family? 3. Musa Ismail Obama, his first cousin and Sayid’s main sidekick. His Royal Highness Prince Mamdouh bin Abdul Aziz accompanied the family of U.S. President Barack Obama in his palace in Jeddah after the performance of the Hajj this year. The event was attended by His Royal Highness Prince Faisal bin Thamer bin Abdul Aziz, and His Royal Highness Prince Abdul Aziz Bin Mamdouh Bin Abdul Aziz, and his HRH Prince Abdullah bin Nayef bin Abdul Aziz, and a number of other princes and officials. The reason for such treatment—as explained in an exclusive interview with Musa Ismail Obama on Al-Jazeera—is that a close relationship was built with Saudi royals. Like president Obama’s call for education in the United States, the Kenyan Obamas embarked on a similar project. …to make a lasting impact on the lives of the orphans and underprivileged children by improving their housing, their education, their upbringing (which) continued to weigh heavily on Mama Sarah. …to help the neglected HIV/AIDS infected and affected in Kogelo village by linking them to care-givers and professional health services providers. That’s what we’re told but when one peruses the foundation’s real activities in Arabic, it reveals a very dark side to the family’s efforts. Musa Ismail Obama, the president’s cousin—in an exclusive interview with Al-Jazeera TV—explained all the troublesome detail, which does not bode well when translated into English: the bulk of the Sarah Fund as it turns out sends little to widows and orphans while the rest goes towards giving free scholarships to studying Sharia at the most influential Wahhabist centers in Saudi Arabia. In the shocking interview, Musa was asked about his communications with cousin Barack, the president of the United States. The soft-spoken Musa explained that the President’s preferred method of communications was through one chosen conduit that relays messages back and forth with the family in Kenya by going through Uncle Sayid Hussein Obama. This is the man who was in attendance with Mama Sarah at Barack Obama’s inauguration in 2009. Musa, Sayid’s sidekick and the public promoter of Mama Sarah’s non-profit became the family’s key advertiser to the social efforts in Kenya. He selects specific Arab media asking wealthy audiences for help, but mandates as a prerequisite that no questions are asked regarding any details of such communications with president Obama or the delving into any political views. Yet, he tells just enough to connect the dots to the wealthy Arab audience of Al-Jazeera. He relays the message to raise all necessary funds since his mission is to transform Kenya to an Islamic majority by using the Obama household name and his grandmother’s non-profit organization. The fund has little to do with secular education or the care for widows and orphans. 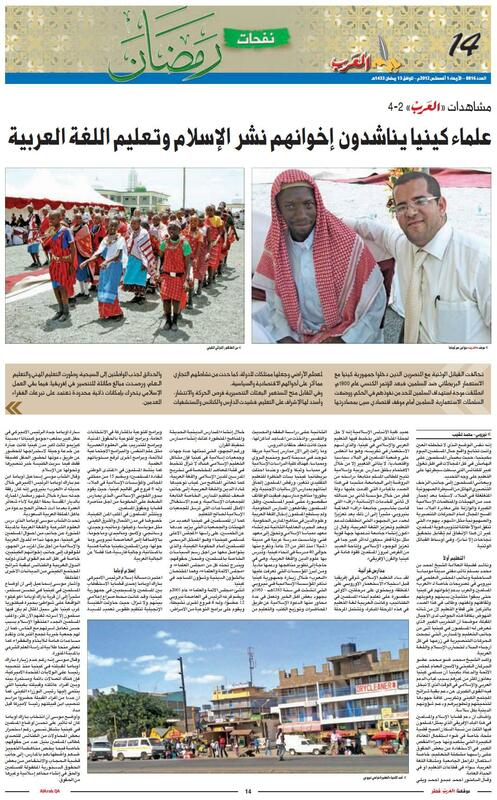 It never once mentions anything in any Arabic media in regards to helping the HIV infected. The bulk of the Sarah’s benevolence fund, as Musa explained, goes toward scholarships destined for Saudi Arabia’s most virulent Wahhabi Sharia centers—the Islamic University in Medina, Umm Al-Qura University in Makkah and the University of Imam Muhammad bin Saud Islamic University in Riyadh. Musa expresses in classical Arabic how he memorized the entire Quran and how he graduated to become an Islamic scholar on Sharia from the Islamic University in Medina. “I studied Arabic and Sharia at the Islamic university in Medina in Saudi Arabia,” exclaimed Musa while explaining his visit to Umm Al Qura University with his uncle Sayid: “In the month of Muharram we visited the dean of Umm Al Qura University, me and my uncle Sayid,” he told Al-Jazeera during the interview. Umm Al Qura University has a heritage that includes being one of Saudi Arabia’s historical and national monuments. A paragon of Wahhabist education, it takes pride that the university was the first to print the works of Muhammad Abdul Wahhab, the founder of the most virulent brand of Islam—Wahhabism. The history of its Wahhabist connections can be seen [here]. On a cover-page of one of Wahhab’s collections from Umm Al Qura University, one can clearly see in fanciful Arabic calligraphy, the title, “Writings of Muhammad Abdul Wahhab” and a stamp that says “A gift from Umm Al Qura University-Mecca” is clearly visible. At Umm Al Qura University, Musa and Sayid Obama—president Obama’s favorite uncle—are seen in photo-ops and were described by several Arab media sources as diligent workers in advancing scholarships for Kenyans to study Sharia, courtesy of Sarah’s fund. “When they [the students] submit an application to Sarah Obama Benevolent Fund, they expect to get what they want but we are flooded,” explains Musa. In what seems like a prepared script, Musa reads what he considers the catastrophe of Kenya, the lack of the process of proselytization, which goes hand-in-hand with Saudi interests seeking help from wealthy Saudis to transform Kenya into a Muslim majority. This goal is also expressed by Al-Arab Newspaper, which covered the call of the Obamas in an interview with Musa Ismail Obama on the sidelines of the inauguration ceremony of World University Ruff in Nairobi [photo here]. His Excellency Dr. Abdullah bin Abdul Mohsin Al-Turki, Secretary General of the Muslim World League, and a member of the Council of Senior Scholars in Saudi Arabia in Makkah received on Monday Mr. Saeed Hussein Obama, Kenyan businessman, and uncle of President Barack Obama, President of the United States of America, who paid a visit to the Muslim World League, accompanied by a number of Kenyan graduates from Saudi universities. As we reported, the Muslim World League has extensive ties to terrorism. If Musa’s claims are true, that Sayid is Barack’s preferred point of contact with his Muslim family and that Sayid is dealing with the MWL, don’t the American people deserve to know the extent of their president’s connections and loyalties to these individuals and groups? The MWL has numerous connections with al Qaeda operatives. In fact, several MWL employees have worked with al Qaeda. Osama bin Laden and al Qaeda gained material support and sponsorship—along with a cover—from MWL offices around the world. Dr. Abdullah bin Abdul Mohsin Al-Turki, Secretary General of the Muslim World League, received Sayid, one of the mostrenowned Wahhabi scholars and a pioneer in spreading Wahhabism through education. The Kenyan Obamas are too. This blogger can’t speak for others, but the biggest irony is that Walid Shoebat – a former, repentant Muslim Brotherhood terrorist – is one of the main forces raising alarm bells in the U.S. and the west in general. Far be for this American-Israeli to hold a grudge, knowing full well that Shoebat’s terror activities were aimed at her Jewish brothers and sisters! However, there is no doubt, he has more than redeemed himself, not only in Israeli/Jewish eyes, but in American eyes. The question remains: despite the above, will U.S. patriots remain blind to his warnings? This entry was posted in Uncategorized and tagged The Obamas Wahhabist Fundraising Empire:Obama's First Cousin Spills The Beans, The Ties That Bind The Islamist-in-Chief To Sunni Islam by Adina Kutnicki. Bookmark the permalink. Pingback: Israel's Voice | HUSSEIN Obama’s ISIS Brotherhood: Their Boston-Based Terror Partnership & Footprints! Pingback: Israel's Voice | America Upside Down: Anti-Jihadists Under Fire, Eliminating Jihadists Verboten! Bring It On. Pingback: Israel's Voice | Islam’s American/Western Conquest Necessitates IMMEDIATE Action Plans: Where To Begin?